On June 1, 2002 Professor Cunningham became the first incumbent of the W. Lee Burge Chair in Law & Ethics at the Georgia State University College of Law. He is the Director of the National Institute for Teaching Ethics & Professionalism (NIFTEP), a consortium of ethics centers at six universities, and the Co-Editor of the International Forum on Teaching Legal Ethics & Professionalism (www.teachinglegalethics.org). He is a member of the Advisory Board for the Academic and Professional Development Committee of the International Bar Association, having previously served as Vice-Chair (Research) for a two-year term. From 2007-2008 he served as the Convenor of the Steering Committee of the Global Alliance for Justice Education, an international organization of over 700 law teachers, lawyers, and leaders of non-governmental organizations from more than 50 countries. He is a leading American scholar on the legal system of India and has consulted around the world on reform in legal education. He publishes on a variety of topics with an emphasis on interdisciplinary and comparative scholarship. His article in the Iowa Law Review, applying semantics to analyze the ways the meaning of "search" has evolved in U.S. constitutional law, won the national Scholarly Papers Competition sponsored by the Association of American Law Schools. "Plain Meaning and Hard Cases," published in the Yale Law Journal and co-authored with three linguists, has been described by Justice Ginsburg as providing useful information on difficult statutory interpretation issues in three different pending Supreme Court cases that were given a linguistic analysis in the article. His article, "Passing Strict Scrutiny: Using Social Science to Design Affirmative Action Programs," Georgetown Law Journal (2002), was co-authored with two social scientists and was based on a friend of the court brief he filed in Adarand Constructors v Mineta, argued in the U.S. Supreme Court in 2001. He has been a visiting scholar at the Indian Law Institute, Sichuan University (China), the University of Sydney (Australia), University of Palermo (Argentina), and the National Law School of India. He directed a three year Ford Foundation project to support the development of human rights clinics in Indian law schools. In 1997 he organized and chaired an international conference, Rethinking Equality in the Global Society, that brought together leading legal scholars, social scientists and policy makers from India, South Africa and the United States to examine affirmative action policies from a cross-national and interdisciplinary perspective. In 2006 he was admitted to membership in The Society of Writers to Her Majesty's Signet in recognition of his work which has led to fundamental changes in the ways client relationship skills are taught and evaluated in Great Britain. At the time he was only the second American to become a member of The Society, the oldest professional association of lawyers in the world, which is charged with custody of the royal seal of the British monarchy. He served as an international member of the Expert Advisory Group for the Learning and Teaching Standards Project-Law of the Australian Learning & Teaching Council (ALTC) which prepared new threshold learning outcomes for legal education in Australia that have since been adopted by the Council of Australian Law Deans; he also was a member of the Project Reference Group for another project supported by the ALTC, Curriculum Renewal in Legal Education: Articulating Final Year Curriculum Design Principles and Designing a Transferable Final Year Program. He is a member of the Chief Justice of Georgia's Commission on Professionalism and served on the Fulton County Criminal Justice Blue Ribbon Commission, whose report on improving criminal justice in metropolitan Atlanta, issued in 2006, was adopted unanimously by the Board of Commissioners of Fulton County. 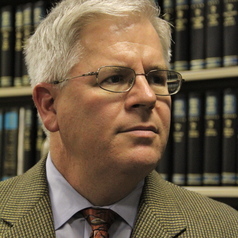 In 2004 he served as Co-Reporter to Georgia's Commission on Indigent Defense. He has served as an expert on legal ethics in a number of major cases and his reasoning has been adopted by the Missouri Supreme Court and federal courts in Georgia and Illinois in decisions disqualifying lawyers for conflicts of interest. He has served as a Special Master, appointed by the Georgia Supreme Court to exercise general supervision over lawyer disciplinary proceedings and to make findings of fact and conclusions of law as to whether discipline should be imposed. He has been an active public interest lawyer, as a legal aid lawyer and civil rights litigator prior to his academic career, as a clinical professor at the University of Michigan, as director of the Washington University Urban Law Clinic (1989-94) and as director of the Washington University Criminal Justice Clinic (1995-98). At Georgia State University he has taught courses in which he and his students have appeared on behalf of criminal defendants, including a complex multi-defendant murder case, and have represented domestic violence victims in civil protection order proceedings. He has litigated a number of federal class action law suits, argued before the Missouri Supreme Court and the U.S. Court of Appeals for the Sixth Circuit, and authored friend-of-the court briefs filed in the Michigan Supreme Court and the U.S. Supreme Court. From 1987-89 Professor Cunningham was a Clinical Assistant Professor of Law at the University of Michigan Law School. From 1989-1993 he was an Associate Professor at the Washington University School of Law in St. Louis; he was promoted to full Professor with tenure in 1993 and continued to teach at Washington University through May 2002.